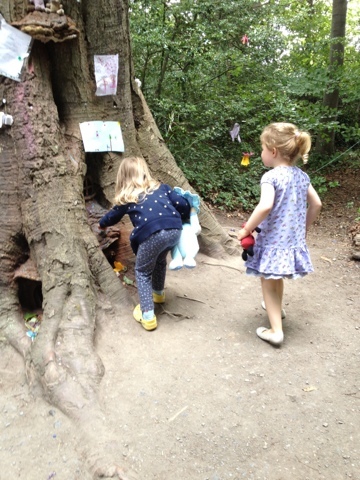 We finally took a visit to the fairy tree in Marlay Park. 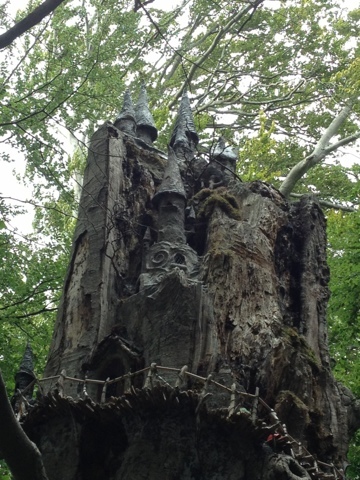 The fairy tree is an old tree trunk that a horde of fairies have made their home. It is along one of the trails in a large park not far from where we live. Somehow, I'm not sure how, given who I am and what I like, I have never been there. Ever. Despite countless visits to this park. 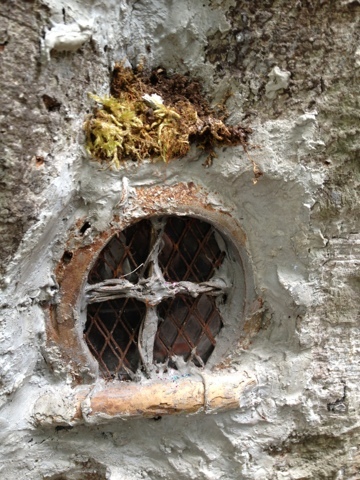 Anyway, these fairies have done a wonderful job on their home. I hear tell that they are constantly upgrading their beautiful home too, which means we will have to go back soon and visit them again. 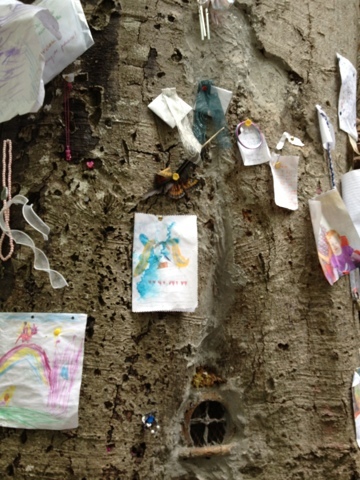 Visiting children leave notes with wishes and small gifts, pinned to the tree for the fairies to find. Small children often leave their soothers (pacifiers) behind for the baby fairies, which is very sweet indeed. Sometimes the notes have a tinge of sadness. Messages for the fairies to pass on to missing pets, or even lost loved ones. My girls were thoroughly enchanted by the tree and spent some time peeping in the windows and knocking on the doors. I never spotted any fairies, though, Sábha swears she saw one peeping over the balcony, high above us and Lile thinks she saw one too, hiding in the leaves along the path. We left a few acorns which I found in my handbag (alongside the beach pebbles, crushed flowers, leaves, notebooks and grocery receipts - you know, the usual things one might find in a lady's handbag!) 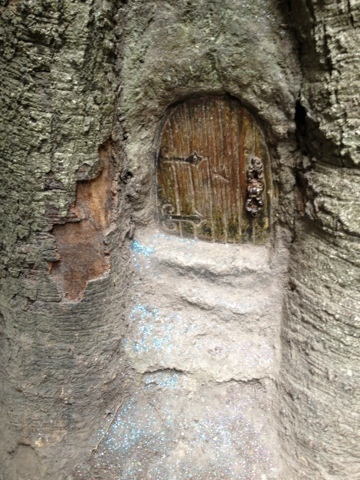 in a little nook and whispered a wish through the front door. The girls hoped that the fairies would watch over them while they started Preschool and make sure they had lots of fun. The magic seems to be working because they are settling in beautifully to their new routine. 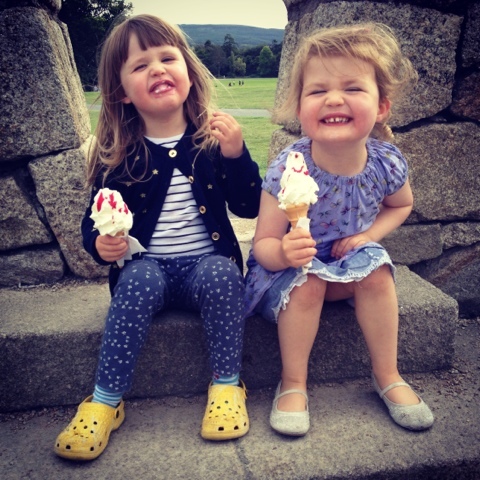 There are shy, but eager little faces each morning, and despite a few tears this morning, on the last day of a very busy week, the girls are happy. 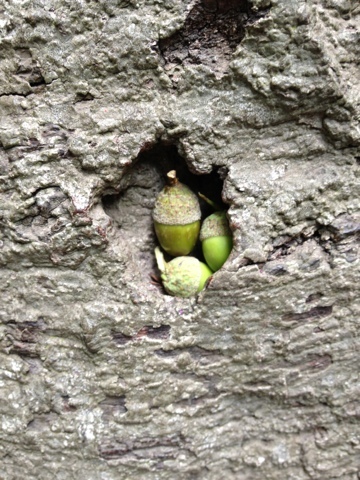 Acorns are obviously good currency in fairyland! How cute! I wish some was close to where I live.